You are here: Home / Recipes / Dinner / Lemon Pasta Salad! 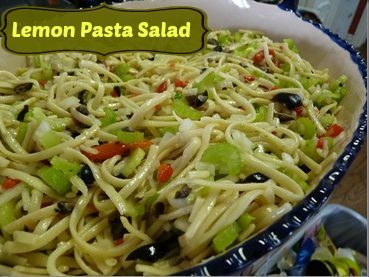 Susan is back and this time she has a recipe for Lemon Pasta Salad! My friend, Rhonda, made this really tasty pasta salad the other day and I loved it. I couldn’t wait to make it myself and so, last week, I did just that. The instructions says that the first night, the pasta has to marinate overnight and then the rest of the ingredients were added the next day. But I will say that 3 days later, this salad was even better. At that point, I added a piece of chicken breast to it and made a meal out of it. I changed it up just a little, of course, but I don’t think it changed the flavor much. Cook and drain your pasta. Marinate them overnight in the next four ingredients. The next day, add the mayo and veggies. The original recipe called for bell peppers but I only had 1 jalepeno so, that is what I used. Both were good choices. I also added the marinated artichoke hearts for kicks and grins. What isn’t better with artichokes? I loved the depth it added. This would be easy to make gluten-free by using different noodles and using gluten-free seasoned salt. I would not change up the seasoning. The flavor combination is a must! Dian….thought you might like to know that the photos aren’t coming up. Hope you have an awesome trip this weekend.